NIST Special Publication 800-53 delivers a catalog of security and privacy controls for federal information systems and organizations designed to help protect them from an increasingly diverse landscape of cyberthreats. The publication provides guidance on customizing these controls to address the security requirements for protecting an organization’s specific missions, business operations, technologies, environments and applications. 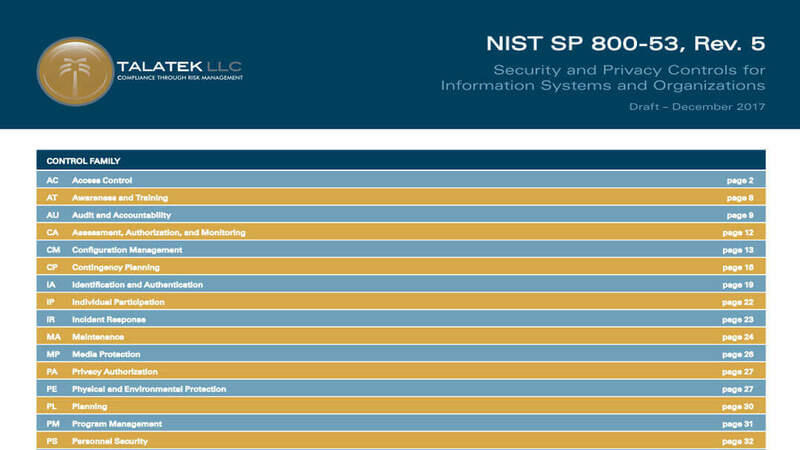 NIST Special Publication 800-53 Rev 5 (draft) includes a comprehensive set of security and privacy controls for all types of computing platforms, including general purpose computing systems, cyber-physical systems, cloud and mobile systems, industrial/process control systems, and Internet of Things (IoT) devices. Release of Revision 5 (draft) concludes a one-year effort to develop next generation security and privacy controls, including changes intended to make the controls more consumable by diverse groups. The ultimate objective: make the information systems we depend on more penetration resistant. And limit the damage from attacks when they occur and ensure systems are resilient and recoverable. TalaTek’s team of experts deep have expertise working with federal agencies and other public-sector clients and can assist with any aspect of the NIST recommendations in this update including continuous monitoring and risk management services. For more details, visit our Services page.